Kogan’s Android 4.2 Smart TV is an interesting product, more innovative than anything we’ve seen recently from any of the big brands. It’s not a seamless integration — almost like a giant, touchscreen-less tablet — but there’s a lot of potential. Beyond the Smart interface, this 55-inch TV is not a bad choice for everyday digital TV or the occasional Blu-ray or movie download. Kogan is not a company you’d usually expect to stand out from the crowd, but its 55-inch Agora Smart 3D LED TV (or KALED553DSMTZA, although we’ll just go with ‘Agora’) is unique in that it’s the first TV available in Australia that runs the Android 4.2 operating system. The TV, also available as a $599 42-inch model, is impressively priced for the number of features it boasts. It has built-in Wi-Fi, three USB ports, can play 3D video, and uses a slim edge-lit LED, Full HD LCD panel. It looks great on paper, and has a huge amount of potential, even though the Android experience is not as seamless as we’d hoped. The 55-inch Agora Smart TV from Kogan has a very thin bezel around its 139cm-diagonal screen, finished in a matte dark grey. The bezel is slightly thicker on the lower edge, with a lighter grey two-tone paint job and a central Kogan logo. The TV’s stand and base connect with a couple of screws, which are self-threading from the base to the neck of the stand — so while it’s a secure connection you won’t want to be dismantling and re-assembling the package often. A standard Kogan remote control is included in the package — we quite like the Kogan remote, which is clearly labelled and colour-coded. However, if at all possible we’d opt for the optional Kogan wireless keyboard and trackpad accessory, which is an extra $39. Navigating around the Android Smart TV interface is extremely difficult with the standard remote control, to the point of being nearly unusable, so if you intend to use the TV’s innovative features there’s a nearly-mandatory extra cost. In terms of connectivity, the Kogan 55” Agora is well catered for, with four USB ports, one component and one composite video input. There are three USB ports (one USB 3.0 compatible for faster transfers), which can accept a wide range of accessories including wireless keyboards and mice, Skype web-cameras, and so on. Wi-Fi comes standard, as does an Ethernet wired connection. One of the HDMI ports supports MHL for syncing and charging a compatible smartphone or tablet while playing back video from it. Being a TV based on the Android 4.2 operating system, which is usually found on smartphones and tablets, the Kogan Agora setup experience is quite like buying a new phone — once you plug it in and turn it on, you’re prompted to connect to your home’s wireless (or wired) home network, upon which the television installs a range of apps for you to use on the TV. After that’s done, you’re sent to the TV’s default Start screen — a conglomeration of a live TV feed and an Android home screen, complete with icons for apps like YouTube, Twitter, Gmail, a Web browser, and some customisable social media widgets and Web bookmarks. This is, in TV terms, quite a complex device. Because of this, it’s a little less refined and streamlined than the custom-made Smart TVs of Samsung, LG, Sony or Panasonic. In practice, we found that the Agora took around 30 seconds to turn on from a completely powered-off state, although the standard power-off mode puts the TV into a low-power sleep and lets it power back on within a few seconds. This is a TV of two halves. There’s the complicated — probably too much so — Android interface, with all the power and all the problems of an equivalent smartphone or tablet, and then there’s the standard TV interface, devoid of any such complexity. On the standard TV side of things, the Agora does a good job. It switches quickly between its 4 HDMI inputs and various legacy (composite, component) connectors. The picture control settings on offer are mediocre — there’s only the option to switch between a few preset modes and adjust brightness, contrast and sharpness, which will be disappointing for anyone looking to calibrate the TV to suit their viewing conditions. Despite that, picture quality from the 55” Agora is good when it’s being supplied with high-quality content, like a 720p or 1080p video via Blu-ray or a downloaded TV or movie file. We’d pair this TV up with a Blu-ray player from a big brand like Sony, Samsung or LG to get the best possible feature-set — since these players can access your home network and the Internet on their own, they can stream movies and video and other services with a little more finesse than the Kogan Smart TV interface. The Android interface is simultaneously excellent, and more trouble than it’s worth. A remote control more versatile than the bundled one is mandatory — it does a good enough job for regular TV and movies or basic menu navigation, but with the standard Android menu on offer you’re going to wish you had a proper keyboard really fast. The advantage of Android is simple, direct, no-complications access to all the Android apps that you know and use (if you’ve got an Android smartphone, at least) — YouTube, Google Play Movies and TV, Google Maps, Twitter, Facebook, and anything else from the Play Store. You can basically use the TV as a giant tablet, connecting directly to the Internet through your home network. If it had a touchscreen, we would like it even more. And for the most part, everything works smoothly. Most apps are formatted by default for the TV’s 16:9 landscape orientation, and most apps run as smoothly as you’d expect from a relatively recent smartphone. The Smart TV interface doesn’t run at the screen’s native 1080p resolution, with all the apps and menus shown at an up-scaled 720p, which is less intensive on the TV’s internal 900Mhz processor. 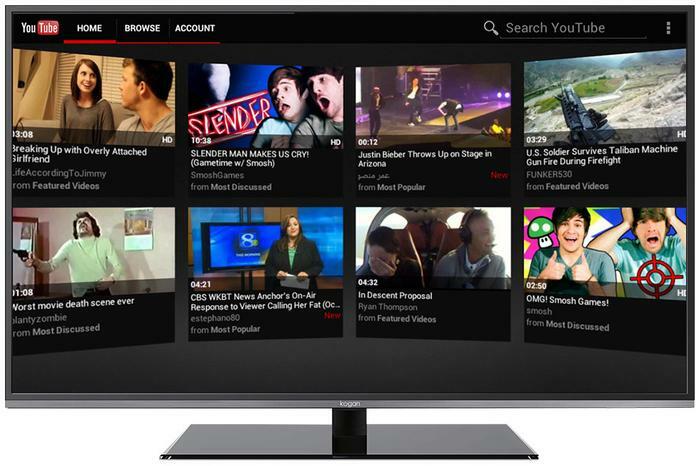 The TV is generally quick to respond to commands from the remote control, although it can get a bit laggy just after opening apps; load up YouTube and until all the video thumbnails are loaded it’ll take a second to respond. There is a caveat, though, and it’s that despite the effort put into customising the Android menu (to integrate the live TV screen, and to add widgets for social media), the Kogan Agora feels somewhat unfinished straight out of the box. Once you’ve added and removed the apps that you like and don’t like, it gets better, but without the easy customisation that a touchscreen allows, it’s a somewhat arduous process. Of course, for the average viewer and user, the TV works perfectly fine. 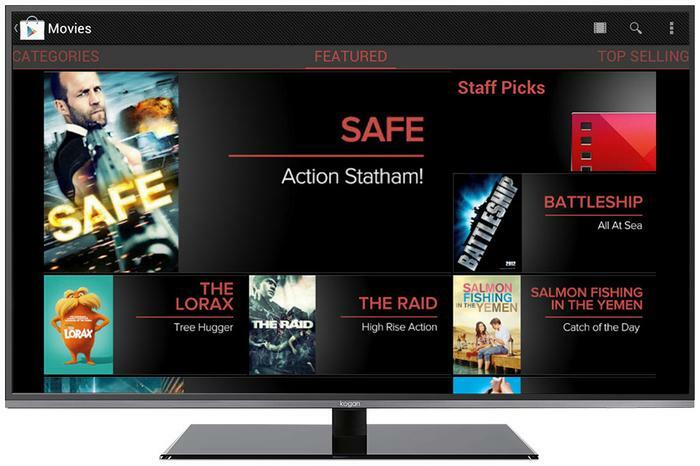 Kogan’s latest Smart TV completely deserves that label. The no-frills Android 4.2 that it runs allows familiar, direct and simple access to a wide range of Android apps, and if you’ve got a capable remote control accessory or the wherewithal to struggle on with the standard clicker, it generally works pretty well. When you don’t want the Smart features, it’s also a generally good TV, with a decent screen and good image quality. It’s not a perfect TV by any stretch, but if you can devote some time to learning its ins and outs, it’s surprisingly powerful and useful.